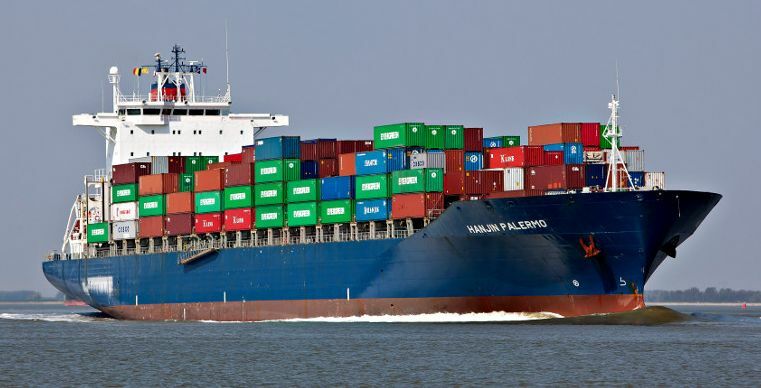 Arriving in New York by container ship.. The Woodends continue their voyage across the Pacific and through the Panama Canal to Houston in the Rickmers Singapore..
To find out more about freighter travel in NSB Freighter Cruises’ container ships or Rickmers Pearl String’s multi-purpose ships please contact The Cruise People Ltd in London at 020 7723 2450 or e-mail cruise@cruisepeople.co.uk.. Almost fifty years ago, in 1962, Avis came up with the advertising slogan “Avis Is Only No. 2, We Try Harder.” Last week, the number two in the cruising world, Royal Caribbean, failed this test by allowing Carnival to try harder while it did nothing, or at least very little. Costa Cruises, in recently announcing that it would add two more decks and some balconies to its Costa Romantica, has joined the ranks of Carnival Cruise Lines and Holland America Line in making alterations to their ships that make them less aesthetically pleasing in order to make more money. And the 200-passenger Aranui 3 is to be upgraded this winter. Today, we look the latest Cruise Market Profile Study from the US-based Cruise Lines International Association, which is quite positive in view of other factors bearing on the industry today. 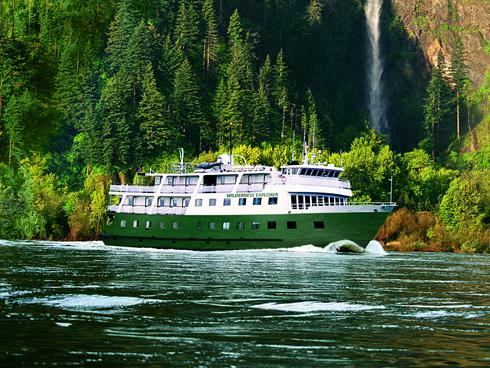 More ships from the former Cruise West fleet find homes, with three going to American Safari Cruises and its InnerSea Discoveries operation and the largest of the US-flag ships going to Travel Dynamics International of New York. As Travel Dynamics intend to use this ship, the Yorktown, in the Great Lakes, we also have a brief look at the history of Great Lakes cruising. 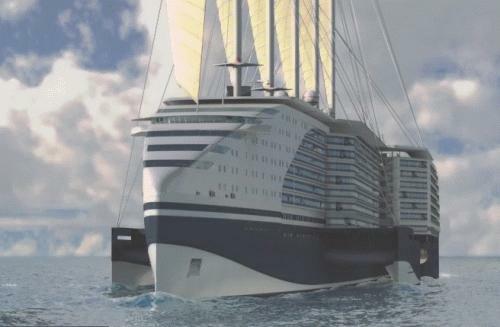 Today, we look at a novel LNG-powered sail-assisted pentamaran cruise ship concept from STX Europe, which would bring several new (and old) ideas to the world of cruising: long promenade decks with balcony cabins off, forward-facing lounges, solar panels, split after superstructure and sail power among them. CLIA’s recently released figures reveal that the North American cruise market recovered quite well in 2010, with growth of 10%. In Canada and the US Pacific Northwest, the cruise associations look at the potential effect of the new North American ECA – to take effect in less than a year, it could cost them up to 390,000 cruise passengers. And on the West Coast, we look at progress in Vancouver and new itineraries from Disney. In the wake of the bureaucratic processing some “foreign” cruise ships have been receiving from the US Department of Homeland Security in recent years, several European-based operators of small to medium-size tonnage have started to avoid making calls in US ports. Now, after the 7-hour delay incurred by P&O’s Arcadia in Los Angeles in late May, we have a look at the situation in a bit more detail as it has affected other operators. 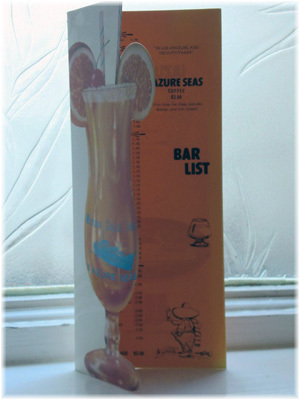 On a lighter note, we look at shipboard drink prices in 1983 compared to today. And how the $1.60 Martini became $10 (or more). We also look at the latest changes to Celebrity Cruises’ “Solstice” class, as introduced by the Celebrity Silhouette, christened in Hamburg last week. These include The Lawn Grill, The Porch, The Art Studio and the new Alcoves.